We are true multi-family flooring experts. You deserve superior installation service, the highest-quality flooring products and the kind of know-how only real experts can provide. Next Day Installations, Saturday Installations and Same Day Emergency Services are available as required on an individual market basis. Contact your Multi-Family Flooring sales representative for more information. Multi-Family Flooring will provide all construction and performance specifications for product selection purposes. Our unique and exclusive product programs will provide the best product for every property, every time. It is our goal to extend the life and performance of the flooring products that are installed in your properties by selecting the performance characteristics that meet the needs of every property. 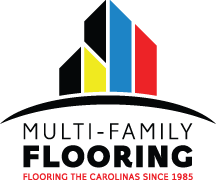 Multi-Family Flooring is a MultiFamily Solutions Member Company. MultiFamily Solutions by FloorExpo, is a national network of independent multi-family flooring contractors dedicated to servicing the largest property management companies and REITs in the industry. Exclusive programs with Armstrong, Shaw, Mohawk and Beaulieu are uniquely tailored to the multi-family market segment and further MultiFamily Solutions’ commitment to superior customer service at competitive prices.